Bananas and plantains make up staples in several worldwide cuisines, and their popularity makes bananas -- a general term that includes plantains -- the fourth most abundant fruit crop in the world, according to Purdue University. In the United States, "banana" refers to the sweet, pale yellow fruit that can be consumed raw, while "plantain" refers to its larger, green relative that's best consumed cooked. 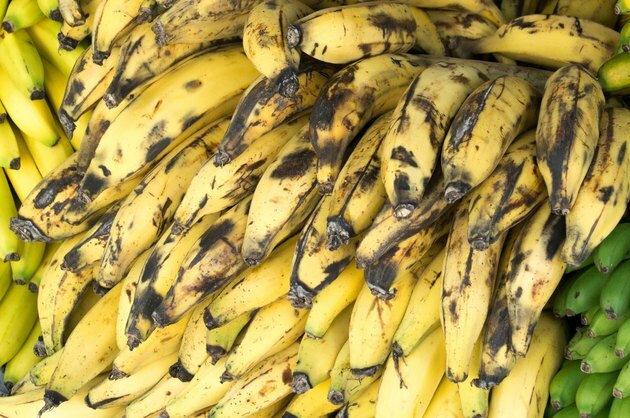 Both foods offer lots of nutritional value and have a place in a healthful and balanced diet, but bananas and plantains differ slightly in their nutrient content. Bananas and plantains both provide moderate amounts of energy -- a cup of sliced bananas contains 134 calories, while an equivalent serving of plantains provides 181 calories. Both foods get the majority of their calories from carbohydrates, and 1-cup servings of bananas and plantains boost your carb intake by 34 grams and 47 grams, respectively. This includes a small amount of beneficial dietary fiber -- 3.9 grams per serving of bananas and 3.4 grams for plantains. Both foods are low in fat and protein, at approximately 0.5 gram of fat and a little less than 2 grams of protein per serving. Bananas and plantains both boost your vitamin C intake, and plantains offer a generous amount of vitamin A as well. Vitamin C plays a key role in tissue health because it functions as an antioxidant. This means that it shields your DNA, proteins and lipids from oxidation, which would otherwise cause cell death. Vitamin A fights disease by boosting your immunity, and it also helps promote new cell growth. Plantains contain 27.2 milligrams of vitamin C per serving -- 30 percent of the daily vitamin C needs for men and 36 percent for women -- while bananas offer 13.1 milligrams per cup. Each serving of plantains also provides 1,668 international units of vitamin A, which is 56 percent of the intake recommendation for men and 71 percent for women. Bananas offer considerably less of the nutrient at 96 international units per serving. Bananas and plantains also offer nutritional value because they provide essential minerals. Their magnesium and potassium content supports muscle function and aids in nerve transmission. Magnesium also helps you produce DNA and proteins, while potassium aids in carbohydrate metabolism. Sliced bananas provide 537 milligrams of potassium per cup, or 11 percent of an adult's daily requirements, while plantains offer 739 milligrams, or 16 percent of an adult's daily requirements. Plantains also contain 55 milligrams of magnesium per serving -- 17 percent of the daily magnesium requirements for women and 13 percent for men -- while bananas offer 41 milligrams per serving. While green, unripe plantains don't pose a health risk, their starchy taste means they're best served cooked. Try slicing peeled plantains, dusting them with cinnamon and then baking them until tender. Alternatively, make a healthful dessert by sprinkling brown sugar over whole peeled plantains and then wrapping the plantain in tinfoil and grilling until tender. Frozen bananas add creamy texture to smoothies, and they can be pureed to make a healthful dessert with a texture similar to soft ice cream. Add mashed bananas to oatmeal as it cooks, or combine mashed bananas with egg whites and protein powder for healthful protein pancakes. Do Bananas Have More Potassium as They Ripen? Can a Diabetic Eat Bananas?